How to get through this without saying apples and pears? 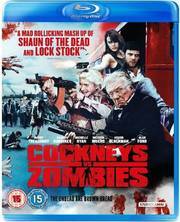 Oops, too late, anyhow, StudioCanal have another brainzzzz title coming out next month, as they release horror comedy Cockneys vs Zombies on both DVD and Blu-Ray. Written by James Moran and directed by Matthias Hoene, this stars Harry Treadaway, Michelle Ryan, Rasmus Hardiker, Ashley Thomas, Georgia King, Jack Doolan, Honor Blackman, Alan Ford, Richard Briers and Dudley Sutton. Extras will include no less than seven short featurettes, a Zombie School feature and a trailer. As contractors at an East London building site unlock a 350 year old vault of seriously hungry zombies, our hapless team of wanna-be bank robbers are in the wrong place at the right time. Katy, Andy, Terry and bank robbing experts Mental Mickey and Davey Tuppence find themselves the unlikely heroes of a zombie attack.